Sandra & I spent much of Sunday unpacking boxes of books, signing them and sorting out pick ups, deliveries and shipping. My car is still filled with books, but they will make their way to you soon. Enjoy! Over the past few weeks I have had the pleasure of reading “Under My Bed” to several groups of students. They’ve given the story a thumbs up and that brings me great joy and satisfaction. Sandra & I will be visiting other schools over the next few months and look forward to answering questions and finding out what’s under other people’s beds. There will be some promotions and giveaways on the Facebook Author Page as well as on Goodreads. Stop by and give me a like, ask a question or share your review of the book. Thank you for being part of this once upon a time and here’s to many more telling of tales. It has been quite the week. The author proofs for the book arrived. I found myself filled with a mix of excitement, trepidation, panic, and a gamut of other emotions as I held the unopened package. Carefully I cut through the copious amounts of tape and reached inside the envelope. My hands trembled a bit as I slid out the 1st hardcover and soft cover copies of “Under My Bed”. As I slowly turned each page i realized that all of the pieces had come together to create something real. And I took a moment to say thank you to everyone who has shared in and supported this adventure and wipe away a happy tear or two. There were some whoops of joy and a happy dance thrown in for good measure too. 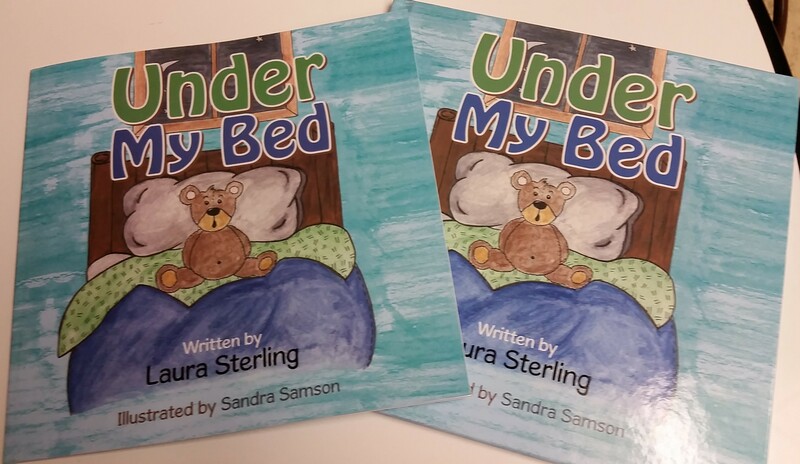 The books are being printed and we are starting to schedule school readings and I am excited to have my little dream become “Under My Bed”, a read together story that I hope brings a few smiles and a giggle or two to readers of all ages. The Thanksgiving weekend was spent looking at the galleys for “Under My Bed”. I was looking for typos, looking at the layout, looking at the design, and looking at all the bits and pieces that make up a book for hours on end. I discovered that I can be quite finicky. And argumentative when I feel strongly about how something should look. Do you know that there is a rule in the book industry that page 1 shall always be on the right. I confess I think rules are often meant to be modified so Author House and I agreed that page 1 of “Under My Bed” is on the left. In order to prevent the overseers of page numbering from finding out we opted to not put page numbers so they don’t need to know we broke the rules. And finally last night I knew I could do no more except to say, “It’s done or as done as I can make it”. And with a click of a button this story I’ve loved is now making its way to the printers where they will put all the pieces together. And I won’t quite believe this is real until I am holding an actual copy of the book in my hands and turning the pages and rediscovering what’s “Under My Bed”. Tonight I am grateful for this journey, for your support, for Dr Seuss & Uncle Llew, and for maintaining my childish wonder in a cynical world despite the odds.